Bring a Friend to the Y for FREE on Friday! Find your balance with a buddy! Bring a friend to the YMCA of Austin for FREE during the following Fridays! At the Y, we’re committed to making sure you’re never alone in your fitness journey. 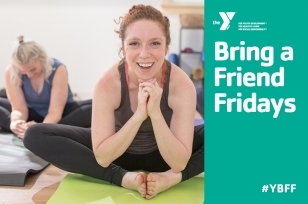 Bring a buddy to the Y for free during our Bring A Friend Friday event. Friends don’t let friends work out alone!